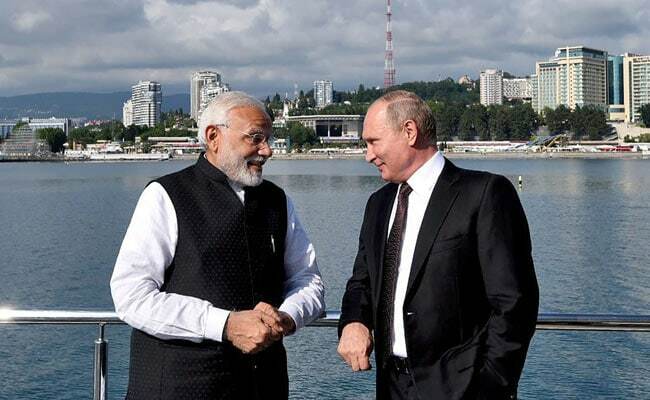 Prime Minister Narendra Modi on Friday showered lavish praise on Russian President Vladimir Putin, putting on display bonhomie between the two leaders. Accepting Russia's highest civilian order announced for his promotion of ties between the two countries, PM Modi said President Putin was a "source of great strength" for the India-Russia friendship. "President Putin remains a source of great strength for the India-Russia friendship. Under his visionary leadership, bilateral and multilateral cooperation between our nations has scaled new heights," PM tweeted. PM Modi will get Russia's highest civilian award, 'Order of Saint Andrew the Apostle', for promoting a special and privileged strategic partnership between Russian and India, the country informed today. Russian President Vladimir Putin has signed the decree to award the PM, its embassy tweeted. "On April 12, Narendra Modi was decorated with the Order of St Andrew the Apostle for exceptional services in promoting special & privileged strategic partnership between Russia and India and friendly relations between the Russian and Indian peoples," the Russian Embassy said in a tweet. PM Modi has thanked the Russian president for the award. "Honoured to receive this prestigious award. I thank President Putin and the people of Russia. Foundations of India-Russia friendship are deep and the future of our partnership is bright. Extensive cooperation between our nations has led to extraordinary outcomes for our citizens," he tweeted. The Order of 'St Andrew the Apostle' is the highest order and the oldest state order of Russia, first established in 1698. It was abolished under the Soviet Union but re-established in 1998. This is the second international award the PM received this month. He was awarded Zayed Medal, the United Arab Emirates' highest civilian award, as a mark of appreciation for his efforts to boost bilateral ties between the two nations.